Hello everybody, I added about 10 new photos of Jennifer and Nicholas when the couple was seen outside the Duke of York’s Theatre in London on May 23. They are small and medium quality, but always worth-seeing. Take a look! Spending time overseas in the UK, Jennifer Lawrence was spotted with her boyfriend Nicholas Hoult, making her way around London, England on Wednesday afternoon. Paying homage to their thespian roots, the couple stopped briefly at Lawrence’s hotel so she could change and then they headed for the Duke of York’s Theatre in the West End. 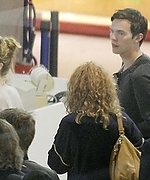 Enjoy the pictures of Jennifer Lawrence out in London with her boyfriend Nicholas Hoult. Yesterday Jennifer Lawrence and her boyfriend Nicholas Hoult were seen at the premiere of Posh ? the new play about a debauched dinner party organised by group of snobby and very lairy Oxford Uni students. According to the sources, Jen rested her head on Nicholas? shoulder during the performance. At the end of the play, the pair were first on their feet to give the cast a standing ovation, and then left the Duke of York?s Theatre holding hands. 5 photos were added to the photo gallery, so check it out!